Today I came across an interesting video on Open Forum. 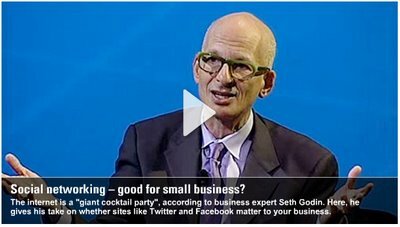 In their series "Inside the Entrepreneurial Mind " bestselling author and thoughtleader Seth Godin made a few interesting remarks about Twitter and Facebook: "They're useless"
The particular video I'm referring to starts with a marketing guy asking what the benefit of networking is for business. "The internet is a giant cocktail party of people swarming around, connecting as much as they can and keeping score...but one day you need to ask them to authorize a 100,000 dollar contract... it doesn't matter"
"Networking is always important when it's real and it's always a useless distraction when it's fake"
Real value comes from real connections. No wonder why Twitter is still looking for a business model, other than just selling a person database and why would people value Facebook in the billions of dollars?